I decided it was finally time to rally my courage and start practicing on painting eyes. First, I watched Dr. Faust’s How to Paint Miniature Eyes on youtube and then I started painting eyes on half a dozen miniatures. 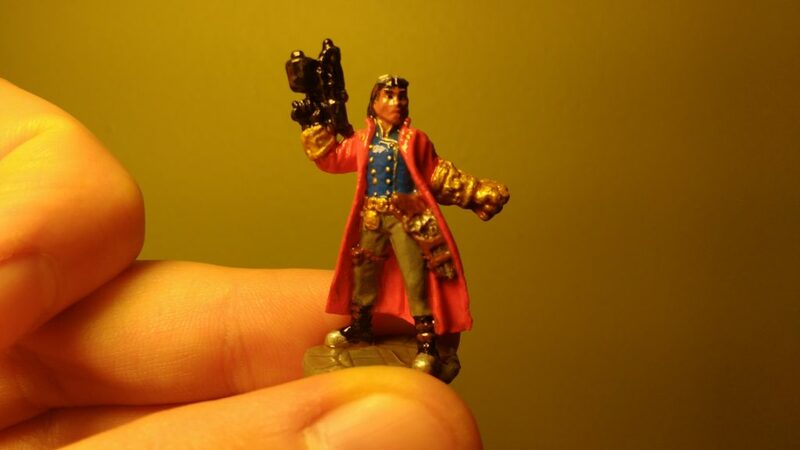 So far I’ve only finished Andre Durant but you can expect more miniatures with painted eyes to come. I plan to eventually go back and add eyes onto some of the previous miniatures as well. But back to Andre. I found Dr. Faust’s video so helpful that I actually watched How to Paint Flesh on Miniatures as well. I don’t think that it really shows through here but I did try to implement some layering on Andre’s face. Wait… What’s wrong with his face? Are those eyes? Indeed they are. I felt very accomplished to have finally painted proper eyes on a miniature and am quite excited to paint more. As a footnote, since I like to cite my sources, Andre Durant like so many of my miniatures is from the original Reaper Bones Kickstarter.